A simple but delicious dessert, you can make this Peach tart in no time and still yield an elegant and delicious pastry. Add this easy peach dessert to your list of quick dessert recipes and you are sure to make this over and over again. When it comes to cutting back on the sweets and indulgent foods, two things, only these two things will be causing my intention to falter: fried chicken and a good pastry dessert. I just love fried chicken. It is a perfectly delicious downfall. Crispy skin, juicy meat and all. And I am equally weak when it comes to a good, buttery and flaky pastry. This Peach Tart sabotaged all my effort for shedding some pounds as I almost ate it all. This peach dessert is easy and while it looks like I spent a great deal of effort making it, it can be done in no time, as fast as the time I can eat the whole thing. Serve this warm and drizzled with the vanilla glaze, and you will understand why you can probably eat one slice after the other. 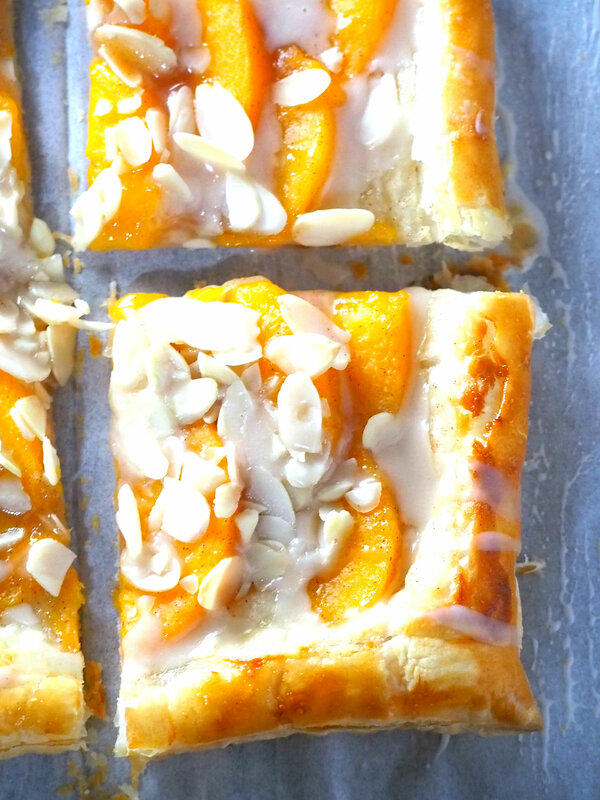 The crunch from the almonds, the freshness from the peach and the buttery puff pastry make every bite of this peach tart so delightful. 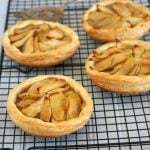 Some more things that can reinforce my giving up are these apple tarts. Also these buttery and flaky chocolate croissants, and these morning buns. Pastries, pastries, pastries. They are so heavenly! You can use fresh peaches instead of canned peaches. You will need 3-4 pieces. Peel them and slice. If you want to make your own puff pastry, I love this easy rough puff pastry recipe. It is my go-to for a quick version. This Peach tart is best eaten the same day as the crispiness of the pastry might be compromised as it sits longer. 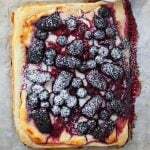 You will see in the recipe that you will have to score the edges of the puff pastry, like creating a border. Those marks are actually going to be your border, as the area outside of the scored edges will puff up while all the area inside will be the container for the peach and almond filling. Watch the baking pastry inside the oven as you approach the baking time. It can burn pretty quickly. You are looking for a nice golden color. 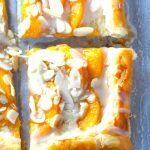 This peach tart is a delicious and easy peach dessert recipe that uses read-made puff pastry and yields a fresh, butter and flaky pastry dessert. 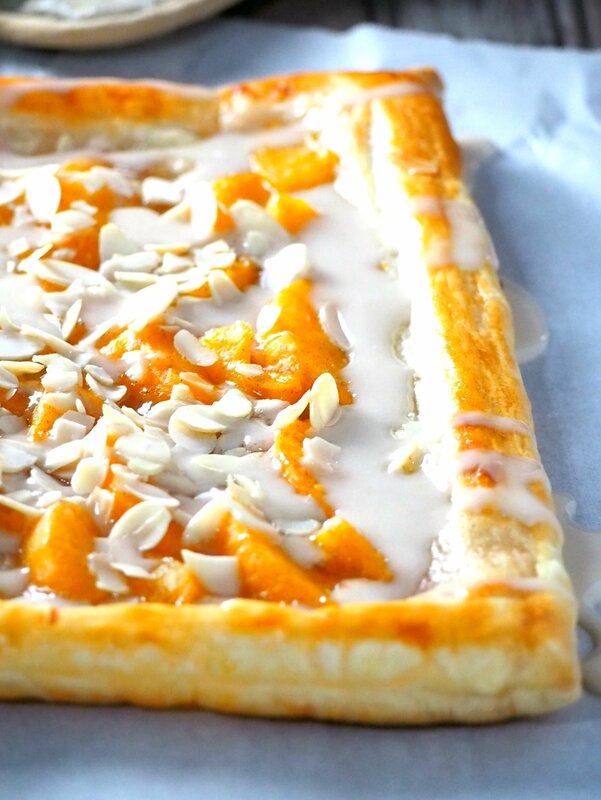 Thaw frozen puff pastry for 3-4 hours in the refrigerator. 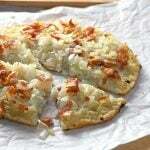 Unroll it and place onto a baking sheet that is lined with parchment paper. Pre-heat oven to 400 F. Score the pastry to make about an inch of border on the sides. Use a knife to lightly make the mark without cutting the pastry all the way. In a medium bowl, combine peaches, flour, cinnamon, and sugar. Mix to incorporate. 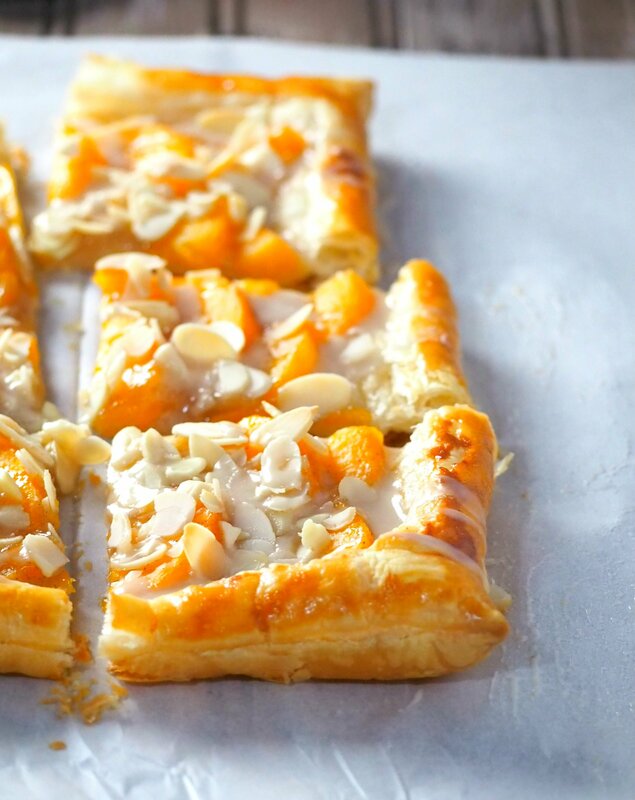 Arrange the peaches over the puff pastry, making sure to leave the outside borders clean. 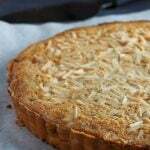 Sprinkle sliced almonds on top. Brush the edges with the beaten egg. Bake for 17-19 minutes. The pastry should be golden. 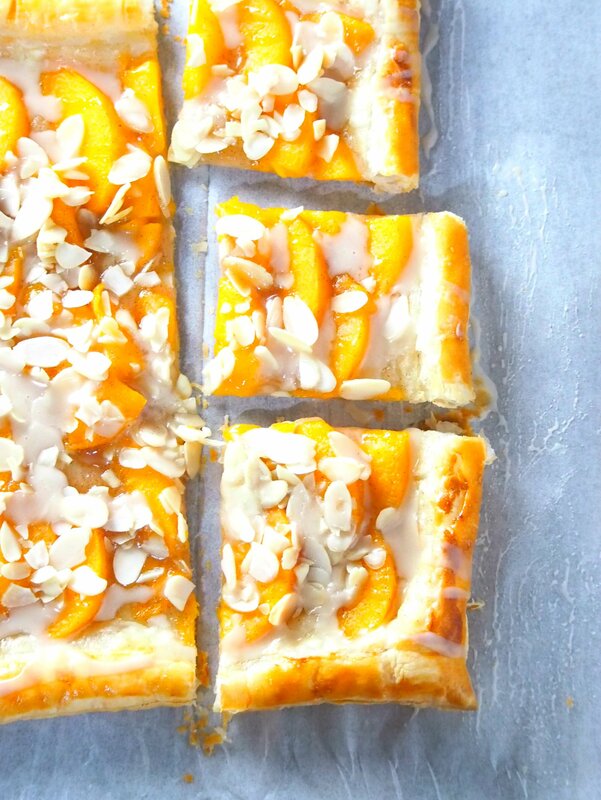 Drizzle the glaze over the warm peach tart. Combine powdered sugar, vanilla and milk. Stir until smooth. This post contains affiliate links. Please see Disclosure Page to learn more.